Announcement My minimalistic jewelry including silver hoop earrings and gemstone silver necklaces are influenced by the Japanese concept of simplicity as inspired by nature. All of my jewelry is hand formed from silver sheets and wire in my San Francisco studio. Let’s keep in touch on Instagram - http://www.instagram.com/ekojewelrydesign. Thanks for visiting my Etsy store! 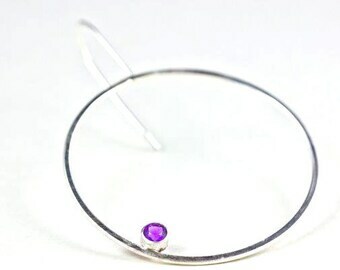 My minimalistic jewelry including silver hoop earrings and gemstone silver necklaces are influenced by the Japanese concept of simplicity as inspired by nature. All of my jewelry is hand formed from silver sheets and wire in my San Francisco studio. The earrings, completion and shipping time were all perfect! I love them and the communication with Eko was perfect, too! My new go-to everyday earrings. Simple, beautiful, and the perfect size. A dress needs a substantial necklace like this Sun locket pendant. A gray top goes well with a white bottom and of course with silver jewelry! Here's the same necklace and earrings worn with both a casual, dress-down style and a more formal dress-up ensemble. Just with a hammer, silver sheets turn into various shapes! 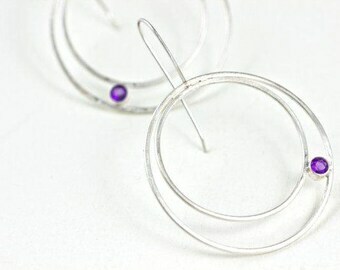 Minimalistic Sterling Silver Jewelry that Lets Your Personality Shine! My passion for jewelry making comes from the magical process of metalsmithing. It’s fascinating how a torch, hammer and various tools can transform a simple sheet of metal into a beautiful piece of jewelry. I make all my jewelry from scratch, using silver sheets and wire. My minimalistic designs are influenced by the Japanese concept of simplicity as inspired by nature, both the sky and the earth. I try to create serenity in every piece I make. I believe fashion is a way to bring one’s inner side out, and jewelry should complement this. I intend for my jewelry to allow every person to express her personality through the selection and coordination of the piece, making it truly shine! I hand-fabricate all my sterling silver jewelry at my studio. Influenced by the artistic creativity and diversity that surrounds me, I’ve called the melting pot of San Francisco my home since 1984. All sterling silver necklaces and earrings by eko jewelry design are hand-fabricated at my studio in San Francisco. Since all of the jewelry is hand-fabricated, each piece may vary slightly from the one pictured. All jewelry is packaged in a cotton-filled gift box with ribbon and shipped with care information. Do not hesitate to contact me if you need further information or clarification about my jewelry. Thank you for stopping by! Promotional sales (15% off or more) are final. For the altered items, such as changing chain length and special orders, the sales are final. You are responsible for shipping your purchase back to me and including a delivery confirmation number. Orders may be paid by Visa, MasterCard, Discover, American Express, PayPal or debit cards. Allow up to 2 weeks before shipping for a custom item. Free Domestic Shipping by USPS Priority Mail: To ensure quick delivery, I will ship by USPS Priority Mail including a tracking number up to three days after payment has been received and funds have become available. Sorry, at this point, I don’t ship internationally. Please convo me if you’d like to have international shipping. eko jewelry design cannot be responsible for post office delays or lost merchandise. You may request insurance at an additional cost. Take jewelry off when you bathe, sleep or swim. Store sterling silver jewelry in an airtight container (for example, a Ziploc bag) to delay the tarnishing process. To remove tarnished sterling silver jewelry, the easiest way is to clean with a polishing cloth/pad. (All of my non-oxidized silver jewelry comes with a polishing pad.) Or clean it in hot water mixed with baking soda together with a piece of aluminum foil, or clean in an aluminum pie pan with hot water and baking soda. Rinse well. It is natural for the patina on oxidized pieces to wear away slightly over time. My oxidized jewelry pieces have been waxed to slow this effect, but some change in patina is still to be expected. Do not clean oxidized silver - it will remove the dark patina.